Since the eruption of Qatar-Gulf diplomatic spat, starting from 5th June, now almost one month has gone. The deadline given by Saudi-led bloc for compliance with 13-demands has been extended till Tuesday, 4th July, night by the mediating efforts made by Kuwait’s Emir Sheikh Sabah Al Ahmad Al Sabah. Air, Sea and Land embargo imposed on Qatar by Saudi Arabia, United Arab Emirates, Bahrain and Egypt is still going on. Though Gulf allies has succeeded in building huge pressure on Qatar during this month by blockading the only land border with Saudi Arabia but it has become obvious that they could not isolate Qatar globally. It may be concluded that Qatar is isolated regionally now but not internationally. Qatar is still possessing international support in many aspects that has made Qatar withstand severe diplomatic pressure of neighbors. No doubt that Qatar is under huge dilemma but it is not standing alone in world’s platform. A sudden decision of severing ties with Qatar by Saudi led Bloc was most likely to create chaos in Qatar but it remained calm and firm, and started managing trade with Iran and Turkey and even allowed quick presence of Turkish troops in country. These moves were strong blows towards Gulf allies blockading Qatar. May be these strategies by Qatar were totally unexpected for Saudi led Block. Involvement of Iran and Turkey in Qatar has also complicated this complex situation for Saudi led Bloc. Qatari nation also stood with their Emir Sheikh Tamim bin Hamad Al Thani so the desired outcomes by Gulf countries were not being produced. Furthermore Qatar did not bow to 13 demands made by Saudi led Bloc. Qatar’s Foreign Minister Mohammed bin Abdulrahman Al Thani declared those demands unrealistic and meant to be rejected though later it showed willingness for negotiations on these demands. Involvement of Iran and Turkey in Qatar has more complicated this complex situation for Saudi led Bloc. Now former CIA director and retired general David Petraeus has said “Our partners should remember that Qatar – at our request – welcomed delegations from the Taliban and Hamas, and that Qatar is now home to our military headquarters for our operations throughout the Middle East.” Petraeus told French newspaper Journal du Dimanche. Moreover, Qatar has invested billions of dollars in USA and Europe that makes tough for these countries to side with Saudi led Bloc against Qatar. 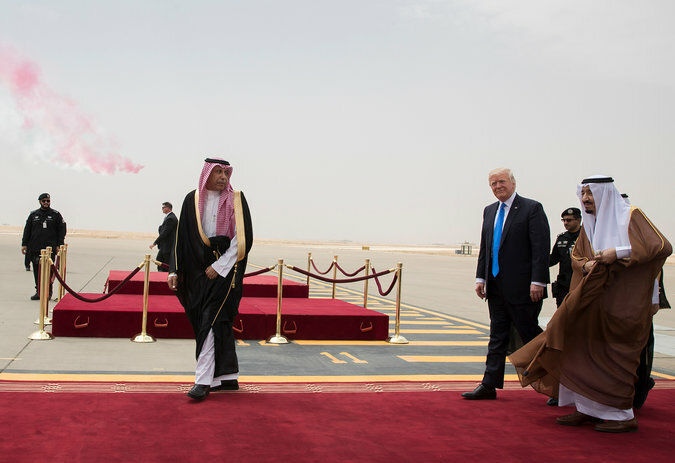 Though US President Donald Trump has supported actions of Gulf Countries against Qatar but it is an important thing that any US President cannot do everything by executive orders as it happens in monarchies. For most of decisions US President has to take permission from Congress. Now Qatar’s Foreign Minister Mohammed bin Abdulrahman Al Thani has delivered his country’s response to a list of 13 demands from Saudi Arabia and three other Arab countries. He has handed over a letter from Qatar’s emir, according to state-run Kuwait News Agency. The content of the letter has not been released. Apparently it is assessed that Qatar has shown flexibility in a few demands of Saudi Bloc. Qatar’s response will be the focus of Wednesday meeting of foreign ministers from the four blockading countries: Saudi Arabia, Egypt, Bahrain and the United Arab Emirates. The meeting will be held at Cairo, Egypt’s Capital. Before Qatar’s response Saudi allies were threatening more sanctions on Qatar. It was clearly depicting that previous embargo had not proved enough for their demands. Jawad Akram is an Islamabad based Freelance International Relations Analyst. He has done Masters in International Relations from University of Sargodha, Pakistan.